Karen is known in Florida as a respected teacher’s teacher and leads her own 200-hr Teacher Training Program, 300-hr and Advanced Trainings, workshops and retreats. Karen has been practicing and inspiring others since 1996 and teaching yoga since 2003. She blends her over two decades of experience and leadership to create her own unique style that is accessible to all. Karen gets her students to move, to balance, to relax, and does it with ethical integrity. She encourages everyone to challenge themselves in a smart and strong way and pushes the boundaries of what a yoga class could be by considering yoga an approach to movement, not a rehearsal of poses. Athletic, flowing, alignment based classes where she skillfully integrates the poetry of yoga philosophy and yoga asana to energetic music is her trademark. But as her students will tell you, her classes are fun, sweaty, creative and always different! Karen’s many certifications include Yoga Alliance E-RYT 500 and in-depth studies with senior teachers of Vinyasa, Ashtanga, Power, Iyengar, Anusara and Yin yoga. 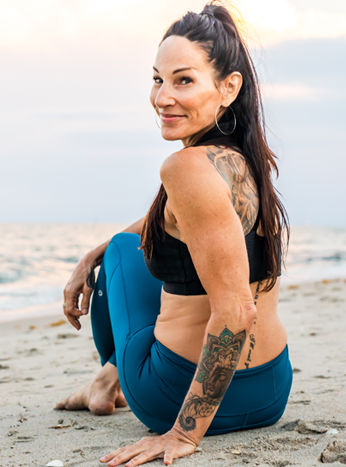 A former professional athlete’s trainer, TV fitness personality, studio owner and entrepreneur, Karen’s diversity gives her the opportunity to have greater reach and support for the health and well-being of students and teachers in her community and beyond. One of her greatest joys is sharing her knowledge with teachers and students participating in her training programs so they can teach and practice wisely, sustainably, and mindfully. Karen is dedicated to the practice of yoga and continues to study with many senior teachers, and her love for yoga continues to grow with each day on the mat. She currently lives and teaches in Palm Beach Gardens at Thrive Power Yoga Palm Beach.